Two and a halve years had passed when I realized that some articles from the TEFR had disappeared from the Internet. I was at the event myself and found it sad that the event seemed to disappear from peoples mind. The original web site was to be closed down and no new such event was planed at this time. At this point I decided to create a new web site in which all articles and images that we could find would appear. The articles can be sorted by stages or by author. Until now we could include 555 single articles into our database. The previous maps where considered as being copy righted, therefore we created new ones with a software visualizations tool. On the official site there were several incorrect participant information, data and statistics that we corrected. 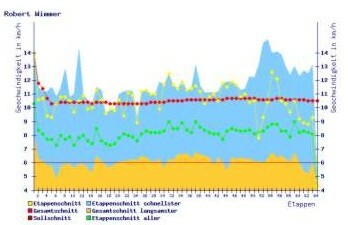 In addition we have added graphics that show his/her speed (daily and overall speed) in visualization. [will be translated soon] Teilnahmebedingungen und Vereinsseiten sind auf dieser Seite nicht mehr enthalten. [will be translated soon] Außerdem habe ich vorerst darauf verzichtet, eine Seite über die Betreuer zu erstellen. Eine solche gibt es bisher nicht. Und ich scheue mich davor, selbst eine zu schreiben, um keinen zu vergessen oder Wesentliches nicht zu schreiben.erzeugt. [will be translated soon] Falls jemand einen weiteren Bericht, Bilder oder Charakterisierungen eines Teilnehmers oder Betreuer kennt oder schreiben möchte nehme ich diesen gerne in die Sammlung auf! 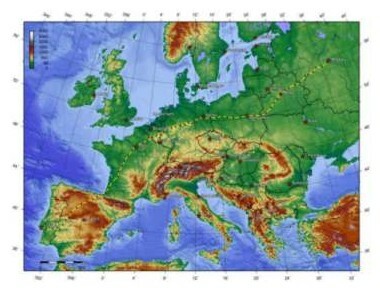 Have a nice time with the TransEurope-Footrace 2003!